Unit Two of our Gr.11 chemistry course examines the different kinds of chemical reactions and how they may be used in variety of applications. Little do we notice, but these kinds of chemical reactions occur constantly within our very cells. These reactions keep us alive, maintain our pH, digest our food, and produce lots of energy. Here we'll discuss step one in cellular respiration for eukaryotic (or more highly evolved) organisms, which is often the only step of cellular respiration in prokaryotic organisms. 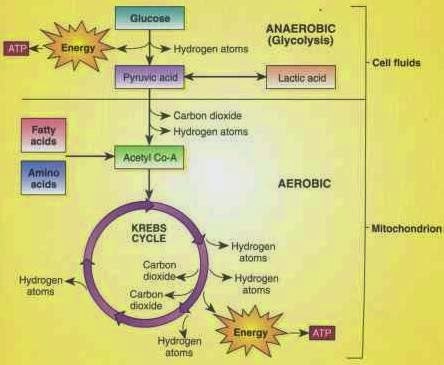 Cellular respiration is process of oxidizing molecules of glucose and trapping the energy produced in ATP. 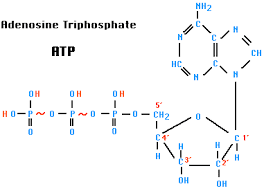 ATP, or adenine triphosphate, is basically the molecular currency of energy transfer. It's phosphorylated (sticking another phosphate on) from ADP (adenine diphosphate), storing energy in that chemical bond. Before describing the series of chemical reactions that take place in glycolysis, step one of cellular respiration, let's talk about the two ways cells convert chemical potential energy from one form into a new one. 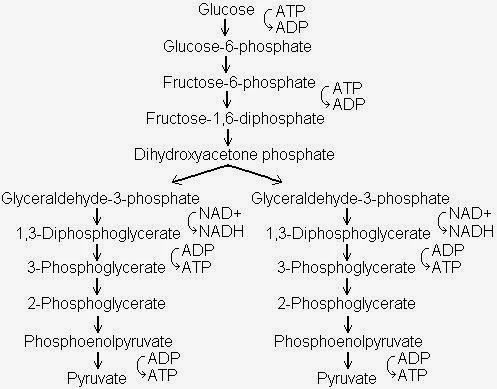 This happens directly in an enzyme catalyzed reaction, when ADP is phosphorylated into ATP, as explained above. During the process, about 31kJ/mol of potential energy is also transferred. This happens indirectly through a series of sequential redox reactions. It's a lot more complex than substrate-level and gives up plenty more ATP. The steps in the actual reaction are numerous and pretty complicated, so we won't get into them here. An overview of the processes involved in cellular respiration and their location within the cell. Glycolysis is an ancient process that is believed to have evolved millions of years ago in single celled organisms, like yeast and some bacterium. It occurs in the cytoplasm of your cells. If you think about, its name tells you exactly what it does. Glyco - sugar, lysis - splitting/breaking. Basically, glycolysis takes a molecule of glucose, which has 6 carbons, and splits in half, producing two 3 carbon sugars, then later pyruvate and some ATP. This occurs in 10 enzyme-catalyzed steps. The first four steps essentially are composed of re-arrangement of molecules. Glucose is rearranged into fructose, etc. Steps 6 - 10 occur twice, once per 3 carbon sugar. The end result is pyruvate and some ATP. After glycolysis, three other processes occur to round out cellular respiration. We won't get into them all here, as that's pretty much a whole unit of biology, but I encourage you to continue taking Bio and learn more about cellular processes. Photosynthesis is also covered, which is super cool as well. If you think you might be interested in this kind of material, but in greater depth, you should definitely think about continuing in biology or biochem. This information is mainly biology based, but it is pretty cool to see how the two sciences intersect. We've got a lot of organic chemistry going on here too! I find it can be hard to think on such a tiny level - within a cell, within an organelle, within a particular part of an organelle! Crazy. I also think that it is important to understand what processes occur in your body, where and why. Learning more about the body's complexity makes me even more in awe of how amazing they are and gives me an even deeper respect for them. 1. Identify the type of chemical reaction that occurs in step 4 of glycolysis. How do you know? 2. What do you think the next step of cellular respiration would be? Why? 3. Why do we need to 'spend' ATP to get glycolysis going? Is there a way around that? 4. Explain why catalysts are important throughout glycolysis. What's their purpose? Unit 3 - Airbags: Friend or Foe?